Color Matching - with many different types of slate, Vermont, Buckingham, PA Gray, Chapman Ribbon, North Country and more, color matching is sometimes difficult. However, our large inventory and suppliers around the country often allow us to match your color and roof type as accurately as possible. 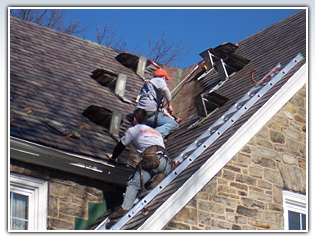 Whether you need minor repairs or a whole new slate roof, we invite you to contact the experts at Zimmerman Slate. 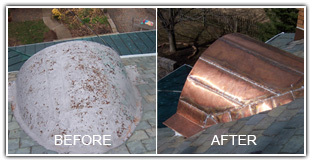 Fill out our online form to get a FREE roofing inspection! One of the major issues with slate roofs is that the valleys and other flashings deteriorate long before the slate wears out. We can replace them!